You are here: Home / Main Dishes / Chili with a Kick! There’s nothing like a bowl of warm chili on a crisp, cool fall day, and I decided to add a little kick to my chili by spiking it up with some bourbon. And let me tell you, it is so very good! I found this recipe in the October 2012 issue of Country Living magazine. Brian Miske, a reader, had submitted his recipe for Bourbon Chili to the magazine, and the resulting 3 page spread really got my attention. So yesterday I decided to try his recipe. And all I can say is thank you, Brian. Your recipe is amazingly good! Now I’ll have to tell you that I have never had bourbon chili (to my knowledge) in my life. I’ve tasted chili with all sorts of unusual ingredients, including chocolate. Leo and his partner on the radio participated in Chili Cook-offs for several years, almost always winning Best Presentation. But if they had just added some bourbon to their chili, they would have won 1st place! The bourbon in this recipe gives the chili complexity and enhances the flavors of all the other ingredients. And this recipe is also a little different from most chili recipes; it has black beans and garbanzo beans rather than the ubiquitous kidney beans. In a large pot over medium heat add beef, 1/4 cup bourbon, half the garlic, 1 teaspoon dried oregano, and 1/2 teaspoon dried sage. Cook until the meat is browned. Transfer the meat to a bowl and set aside. Discard remaining juices. In the same pot over high heat, heat the olive oil. Add onion, bell peppers, jalapeno, orange juice, butter, and remaining garlic. Cook, stirring occasionally, until vegetables begin to soften. Add 1 tablespoon chili powder, 1/2 teaspoon chipotle, 1/4 teaspoon cayenne, and3/4 teaspoon salt. Cook, stirring frequently for 1 minute. Add remaining bourbon reduce heat to medium, and cook until liquid is reduced by half. Add tomatoes and bring mixture to a boil over medium-high heat. Add beans and reserved beef. (If mixture is dry, add up to 1 cup of water.) Reduce heat and simmer, partially covered, for 1 hour. Now this really is the best part (other than the bourbon!) Chop 3 leaves of fresh mint and add it to a 1/4 cup of sour cream. I just happen to have some fresh mint growing, and I have never added mint to sour cream. But I will NEVER go back to putting plain sour cream on chili now. 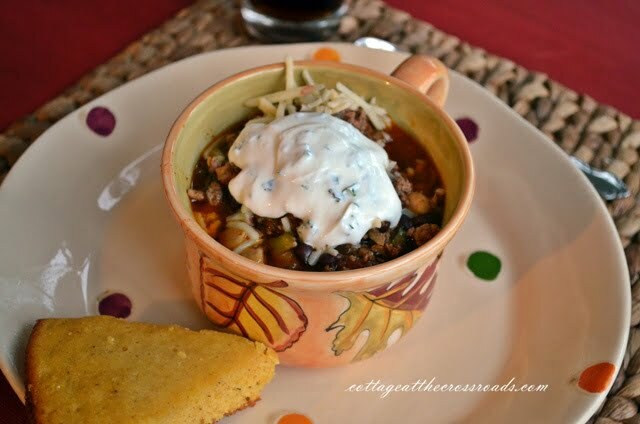 To serve: Divide the chili among bowls and garnish with about a tablespoon of shredded Cheddar or Monterrey Jack cheese. Add a generous dollop of the minted sour cream. Since it was nice and cool yesterday evening, Leo and I had our chili on the front porch. I served a little cornbread alongside the chili. Leo said there was a plethora of flavors in the chili. That was a real compliment, and that’s what you’ll get if you use this recipe the next time you make chili. And this was our after dinner treat! That chili looks fantastic! I bet the flavors are just delicious, I can’t wait to try this recipe. 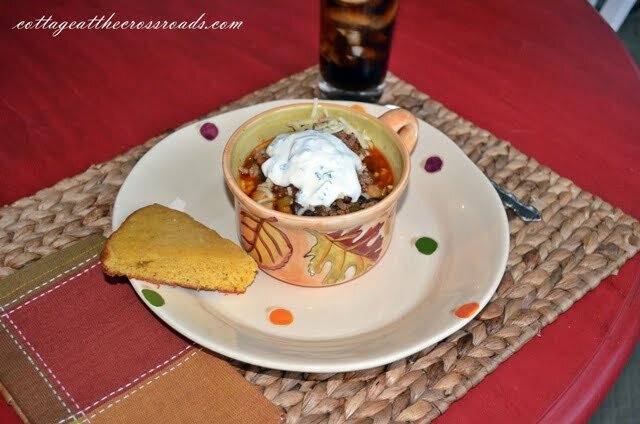 I have tried many different recipes in an attempt to find that ‘perfect’ chili. While they are all very yummy, the best so far has been a three bean chili with ground beef, steak and sausage, it’s really quite good with complex flavors. I think your recipe may be the winner, however….I am especially excited to try the mint in the sour cream…and the bourbon, of course! I stumbled upon your website quite by accident. I love your beautiful cottage and your walkway turned out just great! I also love the way your decorate for Christmas, so festive and cosy, your family must love to come for parties! All the best to you from way up North in Calgary, Alberta! This is the perfect time of year for chili. My dad just asked me the other day to make some. Your photos are really good by the way. You are definitely getting the hang of the new camera. I wish I had time to do the Shoot Fly Shoot class. I want to get off the auto setting so bad. Soon I hope! I just love a good bowl of steaming chili! I’ve never had it with bourbon either. It sure looks tasty and I’m sure has a kick to it. 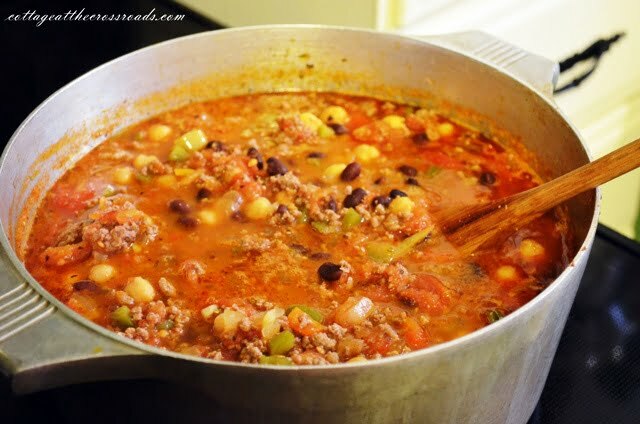 🙂 Have you ever had chili made with stew meat? Its good too! This sounds like a very interesting chili…I’m looking forward to trying it. 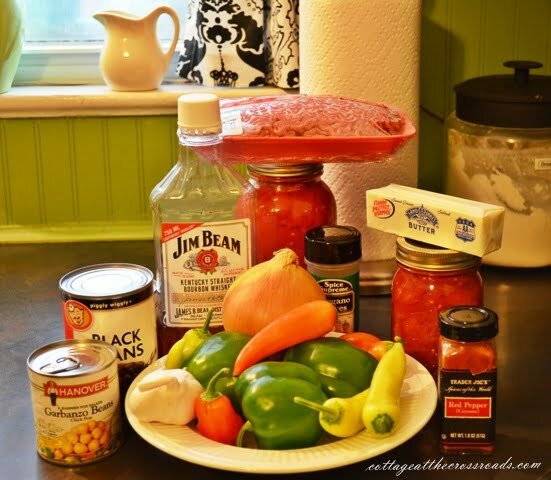 Wow Jane~ That chili recipe sounds full of flavor! I have the CL issue, but totally overlooked that recipe~ I’ll have to go back and look it up. I’ve had beer in my chili but never bourbon~ the oj sounds like an interesting addition too. Love your mugs & plates on your red table! I uselessly add beer to mine. I like trying new recipes. I will have to give this one a try. Now that looks like my kinda chili. I have made my Mama Hazel’s (grandmother) recipe for years and we LOVE it, but I think I may just have to kick it up a notch with your recipe……and I love the red table……I think I’d be out there all the time! That looks like the perfect dinner on a cold night! 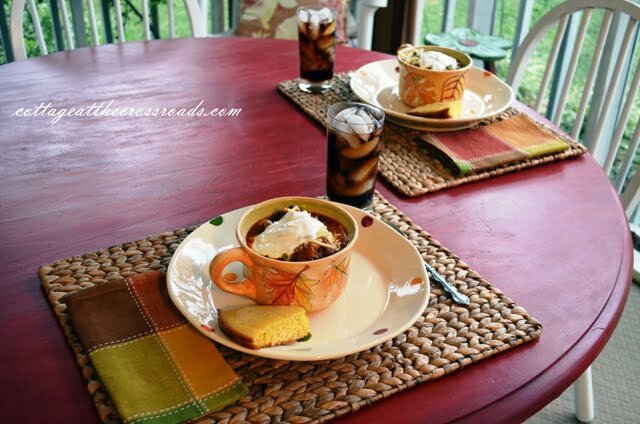 I’m always looking for different chili recipes, so thanks for sharing it! Jane, the recipe sounds great! 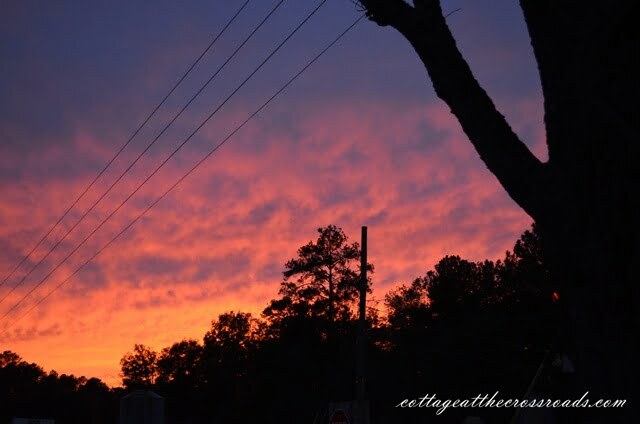 And that sunset picture is amazing! It does sound yummy our temps are in the 20-40’s and chilli would hit the spot. I am having trouble with my reader, so sorry if I have missed your posts, I am still working on getting it fixed. Goodness that looks good. Need to look at my magazine and try that recipe. That really sounds good right now! And when I saw the stack of ingredients…I knew I would like it! We are having a cold light rain here in the mountains and it’s in the low 40s! BBbbbrrrr!